I LOVE St. Patrick’s Day. Maybe because I’m Irish, maybe because I love to drink, maybe because I hate snakes. I don’t know. 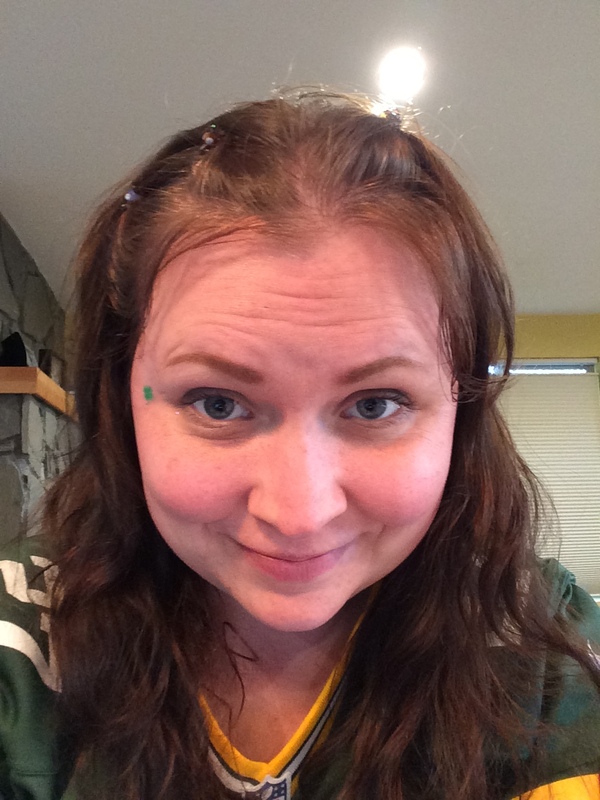 I wore this little four leaf clover sticker on my face all day, and put them on anyone who would let me. Even the girl handing out liquor samples at the store (obviously the most awesome girl ever!). She was super excited about her sticker. Anyway, I concocted a little potion for those of us that want a festive green drink, but don’t like beer. This recipe is for a basic mojito, but I subbed cachaca (a Brazilian liquor similar to rum, but with a little more bite. It is most commonly used to make caipirinhas) for the rum. Enjoy!! Step 1: assemble all ingredients. Wash and cut the lime into eight pieces, and wash the mint. Step 2: Use about this much mint for one drink. You can leave the stems on for a little more flavor, or remove the leaves for a prettier look. Your choice. 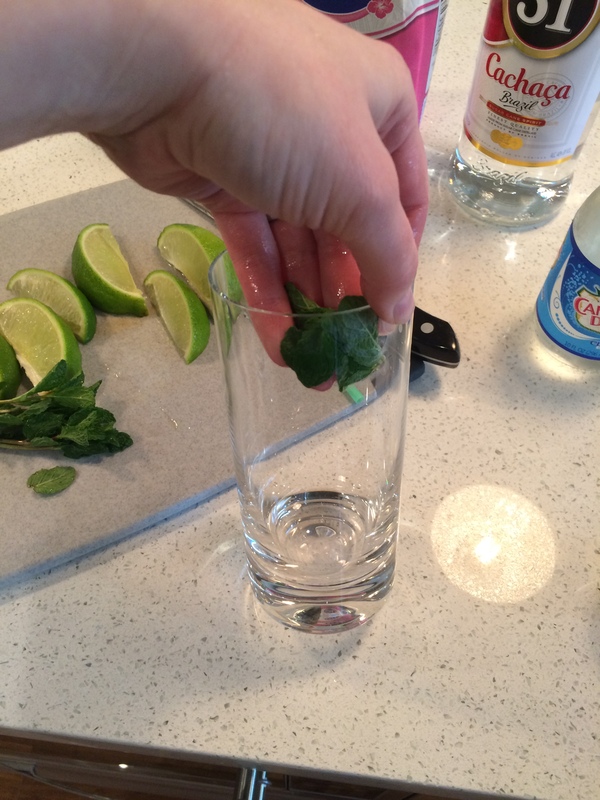 Step 4: Put all of the mint, even what you used in the glass, into whatever you plan to muddle in (a shaker, a wooden cup, the glass). Add half of the lime and two teaspoons of sugar. Muddle them all together- just smash them up until the juice is out of the limes. If you don’t have a muddler, you can use a spoon. Then add about a shot and a half of cachaca and muddle again. If you’re using a shaker, at this point add ice and shake it all up like crazy. If not, fill your glass with ice, then pour this mixture on top. If you used a shaker, just pour everything in the glass (you want to leave the lime peel and mint in). This picture illustrates how much room I had left at the top after pouring mine into the glass. Step 5: To finish it off, top it off with soda water and garnish if you like. Happy St Pats Day! Cute picture! I wish I had a sticker. Your face looks skinnier. =) love you! Lol I love it 🙂 that’s awesome. Hey, I’m still making them 😉 they’re good any day of the year!